The low-key revolution continues throughout the Fall of 2017, and Roland Sands continues to take their place at the head of the charge. As such, the new Hefe jacket lines up nicely with their current arsenal and will be a juggernaut for many miles to come. Constructed of a denim body with matte buffalo leather sleeves, the Roland Sands Hefe Jacket brings together two worlds into one jacket. To give the denim a bit more resilience against the rigors of the road, RSD has utilized heavyweight DuPont Kevlar in the mix that will increase the slide time should it come into contact with the asphalt. Internally, the Hefe jacket features a satin poly mesh lining and pockets for armor at the elbows, shoulders, and back. Additional features include rotated pre-curved sleeves for comfort in the riding position, center front rubberized shank snaps, and back flex gussets that allow for added mobility when reaching for the bars. Riding a motorcycle is fun. It is also really cool. At the same time, it should not be uncomfortable or put riders in a position not to be defended properly in the event of a crash. 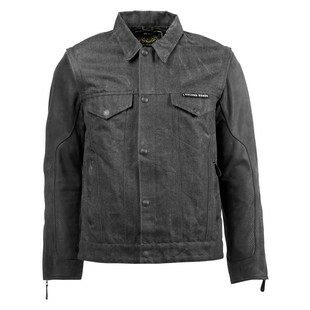 The RSD Hefe motorcycle jacket is the epitome of the former two traits, while being an answer to the latter two hindrances.